Understanding the hype and fascination around the majestic Orchid. In floral gifting, the Orchid variety gets top priority along with the Rose. Although the Rose has a romantic connotation in gifting, it is the Orchid variety that gets preference while sending gifts to family, elders, relatives, friends or for business purposes. Their neutral yet glamorous appeal makes this plant a perfect gift for Birthdays, Anniversaries, Thank You and Congratulation specific occasions. Also owing to its long stem life, serenity, variety, wide price range and availability, is why most people across the world commonly choose to gift an Orchid plant over any other flower. The serenity and purity that loved ones feel upon receiving this mystique delight is no match for any other gift. For centuries, the orchid has been a symbol of love, luxury and beauty. To the early Greeks, the orchid was a symbol of virility while the Chinese have known it as “the plant of the king’s fragrance.” During the Middle Ages, the orchid was considered an aphrodisiac and was used in love potions. The plant was widely used for many medicinal purposes in ancient times as a cure for heart ailments, coughs and other illness. The Aztecs used to drink a mixture of vanilla orchid and chocolate. They thought it helped give them power and strength. It was sometime during the 18th century when scientist and botanists established the ‘Orchidaceae’ or commonly known Orchid to be the most widely grown and oldest plant on the planet. Today however, orchids have become an indoor ornamental flowering plant and number One contender in Floral Gifting. Based on their growth, climate and maintenance they are classified into three main categories namely: epiphytes, lithophytes and terrestrials. However botanists and gardeners are discovering a new hybrid variety every week to make them more suitable to maintain and bloom, this makes the classification in the Orchid family a tedious affair. Dendrobium and Mokara are among the most popular types of orchid plants. Dendrobiums are mainly in white and purple while Mokaras are available in red, mauve and yellowish brown color scales. These are usually found in Asia and other tropical areas, including the Philippines, Borneo, New Zealand, Australia, and New Guinea. Indoor potted Denbrobium and Phalaenopsis plants are surprisingly easy to look after and make an excellent gifting gesture. The graceful Phalaenopsis or Moth Orchid, is prized for its flaring, oval petals and moon shaped flowers. For this reason, it is one of the most used species in Phalaenopsis hybridizing. Among other types we have the famous Oriental Vanda Orchid – prized for its rare blue coloration, the South American Cattleya – wildly grown in the Amazon rainforests, Jewel Orchids – known for their cluster intrinsic patterns, South African Disa and many more! 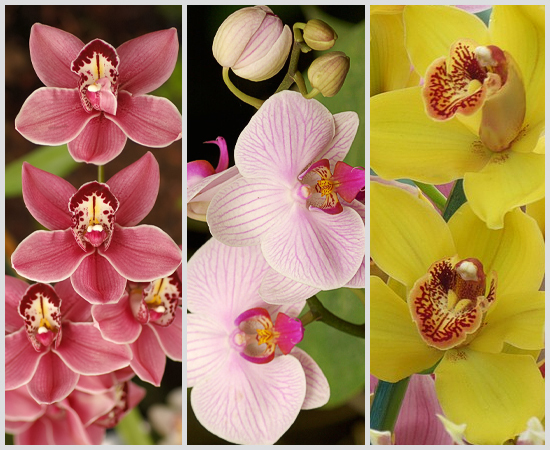 Do you have favorite Orchid variety? Send Orchids to the U.S.A. Send Orchids to the U.K. This entry was posted in News and tagged Dendrobium, Exotic Flower, Flower, Mokara, Orchids. Bookmark the permalink.